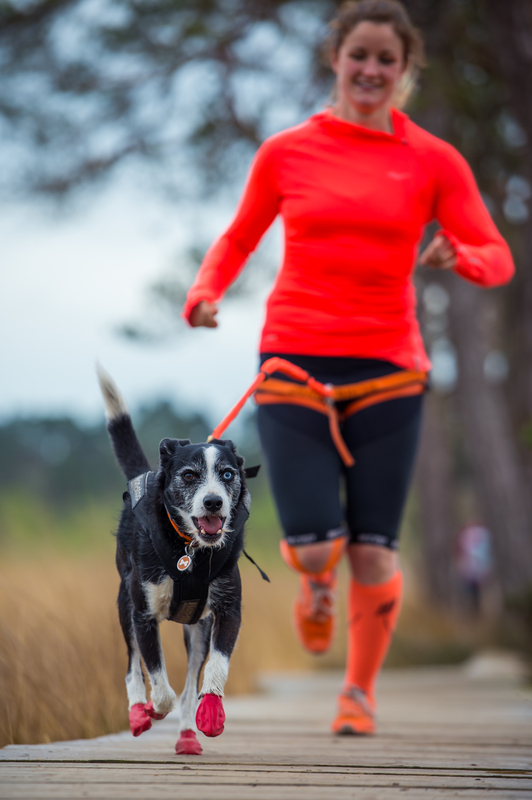 Which Canicross waist belt? Part 3. This is the third and final part of my mini series on Canicross waist belts. I’ve already covered the Non Stop Running Belt and the Rock Empire Waist Belt. Today’s post features our Kisi Lightweight belt; a popular canicross waist belt that also sits low to avoid any unnecessary back strain. The Kisi waist belt is lightweight with mesh padding make it comfortable and highly efficient. It comes in a range of colours (something the other brands don’t offer) and in different sizes with fully adjustable waist and leg straps. The main part of the waist belt (the thicker band with webbing that prevents sliding) sits on the runner’s bottom and the precise fit (slightly higher or lower on the glutes), as with the non stop waist belt, is down to personal preference and can be adjusted using the handy straps incorporated in the sides of the belt. The thiner waist strap (the section above the main part of the waist belt) sits on the hips and fastens together at the front of the belt behind the strap where the ring you attach your bungee line to is located. The thiner waist strap (the section above the main part of the waist belt) fastens together easily at the front of the belt behind the main strap where the section for attaching your bungee line is located. Like the Rock Empire waist belt there is a fixed material loop that you clip your line onto. 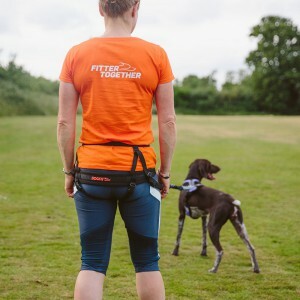 This loop is designed to take the pull from your dog and along with the leg straps ensures that any force transfers through the hips and not the back. This minimises any strain and longer term injury, this maximising comfort. The leg straps themselves can be adjusted for maximum comfort. They are also completely detachable. Whilst we don’t recommend you run without the leg straps, since they perform an essential role in your overall safety and performance, for the ladies it can be convenient if you are caught short on a long run where you can just unclip the front part of the strap, saving you from removing the whole belt! Cost – At £43.99 the Kisi Lightweight waist belt is comparable in price to the Rock Empire belt and is a perfect item for both beginners and experienced canicrossers. The loop at the front (which the line attaches to) is fixed so the clip of the line doesn’t slide along the full webbing as the dog turns direction?? Having now covered all three of the main waist belts that we sell and recommend you can see how they each offer optimum performance but there are subtle differences between them. Ultimately they are all super light and comfortable so it’s really down to personal preference. Hopefully, along with this review, you are better informed about which belt is right for you. But if you are still in any doubt, do call us and we’ll be more than happy to give you some advice.